Kullu is located at 240 kms from shimla,the capital of Himachal Pradesh. Kullu Manali is the most exotic hill station among the most favored tourist destinations among the hill stations of India. In the ancient times Kullu Manali was also known as “Kulanthpitha” which means the end of habitable world because the ancient Hindus regarded Kullu as the farthest limit of human habitation. Even in the epic of the Ramayana and mahabharta the original name of Kullu has been mentioned. Among this tourist complex of Kullu Manali, kullu is the central point and it is located on the bank of river Beas.This main river valley runs from North to South an it is only 80 km long and its width is not more than 2 km but still a fairly wide area is open to the visitors to enjoy the spectacle of beautiful mountain scenery. Kullu is also known as Valley of Gods as it has many temples. 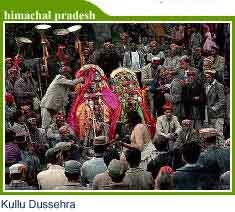 The Dashehra of Kullu is world famous. Kullu Manali is natural paradise with full of numerous tourist attractions in and around Kullu Manali. This is the holiest temple of Kullu. It is dedicated to as its name suggest, to Lord Raghunathji that is Lord Ram. It is said that in 17th century then king of Kullu, Raja Jagat Singh committed a great wrong. After his sin to atone for his wrong doing he sent a courtier to Ayodhya to bring a statue of Lord Raghunath that is Lord Ram Then he built the temple for the diety to house the image and even today, is greatly revered. There is an image of Shri Raghunath in his chariot in the shrine. This is the most striking temple in Kullu and is located at a distance of mere 10 km from the centre of Kullu Town. Lord Shiva is the main deity of this temple and this temple is dedicated o Lord Shiva. There is a 20 meter tall image or “Linga” projecting out of the shrine. It is said that it catches lightening in the skies and due to this Linga turns into pieces which is then restored by the temple priests with only butter and sattu. The legend says that this experience of lightening and reducing of Shivlinga into pieces is because Lord Shiva absorbs the lightening when it strikes the earth and thus the world is saved by the Lord. As this cycle of lightening and reducing of Linga into pieces and restoring of Shivalinga by the priests happens every year therefore the name of this temple is Bijli mahadev Temple. A panoramic view of Kulu and Parvati valleys can be seen from the temple. The temple has a 60 feet high staff which glistens like a silver needle in the sun. 6 Km South of Manali Jagatsukh is one of the biggest villages in Kullu district. Although the place is dotted with numerous old temples but one of the major attraction of Jagatsukh is an ancient Shiva temple. This Shiva temple is built in Shikhara style. Other tourist attractions of Jagatsukh include small shrine of Gaurishankar and the temple of Goddess Sandhyadevi which is chalet-roofed temple. This is a wildlife sanctuary which is located at the distance of 2 km from the main town of Manali. At this sanctuary a wide variety of animals and birds can be seen which includes many varied species of lions, leopards and ibex. The Winter Carnival: In the month of January a five-day event is celebrated at Manali every year. This winter carnival is one of the most favored tourist attractions. Tourists from not only India but from all over the world come to attend and enjoy this winter carnival of Kullu. At this time of the year the whole city is covered with the thick blanket of snow. The winter carnival starts with the worship of Hidimba Devi and the celebration starts from the temple itself. A large amount of tourists come to Kullu Manali to be a part of the celebration. Tourism in Kullu is mainly concerned with temples and hot springs around the entire Kullu area. There are not only many famous temples like BijliMahadev temple, Jagannath Temple, Raghunathji Temple, Bajeshwar temple but along with these temples Manikaran and its hot spring is also very famous and attractive. There is also avery fine camping site at Kullu and that is Raison. Manali Tourist complex is world famous which offers many adventurous sports activities. Not only in summer but Manali is thrilling and shows a lavish display of natural beauty even in winter. In fact Manali is one of the most key tourist attractions of Himachal Pradesh and it attracts tourists throughout the year. I am Susan Hannan from Exams Key; it gives 100% ISEB-BA1 exam exams. Let’s take benefit of S10-300 exam Exams material efficiently and get guaranteed success. Check out free demo of all certifications Exam. It’s very useful information. Want to visit your home country, India, someday. Thanks for following my blog. Just could not depart your web site. This place Kullu Manali is worth a visit.Am gonna be back often in order to check up on new posts. Very nice info you got there. I needed it for my project on Kallu-Manali. Thanks for sharing this. I think the tourists main attraction for kullu & manali is snowy peaks & Dashehra festival. I think you have to add some more pictures to your blog. I think that content related pictures attract reader towards your blog!! Keep Sharing! !